The Questeq Leadership Team empowers its onsite and offsite education technology management teams to transform your schools. Jeff has been with Questeq since 1999. A 20-year veteran of the technology industry, Jeff directs a range of strategic initiatives to constantly improve and successfully deliver the company’s core Educational Technology Management (ETM) service. Prior to joining the company, he gained experience as a Systems Engineer and Programmer Analyst during his eleven years with FedEx Ground. He has served on the Robert Morris University Board of Visitors and the Pittsburgh Airport Area Chamber Board of Directors. Jeff holds a Bachelor of Science degree in the information sciences from DeVry University. Lynda manages Questeq’s accounting department and the company 401K plan. Before she and Ron founded Questeq, Lynda worked at Columbia Gas of PA as a customer service representative and as office manager for McNellis Co. She is actively involved with the Allegheny Valley School for Blind Children Parents Association. Ron founded Questeq after recognizing the need for such a venture while teaching in the Youngstown School District. He is the Chairman of the Board for the Larry Bruno Foundation and sits on the board of trustees for the Carnegie Library of Beaver Falls. Ron also serves on the advisory board of Asset Inc., a non-profit organization that provides professional development for K-12 schools. Ron holds a Bachelor of Arts degree in mathematics and a Bachelor of Science degree in education from Youngstown State University. Jessica has been with Questeq since 1998 as the Human Resources Manager. Prior to her position with Questeq, she was a TSS for Lutheran Youth and Family Services. Jessica has served on numerous boards and is a past vendor chair for the Bartko Foundation’s Annual Ladies Luncheon. She has a Bachelor of Science in Applied Science degree from Youngstown State University and completed the University of Pittsburgh’s Katz Graduate School MBA Essentials Program. In late 2014 Jessica transitioned from HR to Director of Business Administration. In 2018, Jessica was appointed President of Blessed Bag, a 501c3 non-profit that provides comfort items to cancer patients. Jason joined Questeq in early 2011, initially in the position of Technology Director for North Hills School District. His decades of industry experience, leadership traits and passion for the mission of educational support translated into an expanded role in 2014 to include oversight of all Questeq field operations. Jason is a proud veteran of the U.S. Air Force, having concluded his honorable military service with the Pennsylvania Air National Guard in the role of Network Manager for the 171st Air Refueling Wing in Pittsburgh, PA. He holds a Master of Education degree in Information Science and Learning Technologies from the University of Missouri as well as a Bachelor of Science in Information Technology. Jeff joined the Questeq Leadership Team in 2014 as Director of Human Resources. He comes to us with extensive skills and experience in managing the corporate Human Resources function. Jeff has 15+ years of management experience focusing on strategic management and leadership. He holds a Master of Science degree in Human Resources Management from La Roche College, and Bachelor of Science degree in Business Administration from Gannon University. Rick brings a wide breadth of experience to Questeq. He has held account management positions at companies such as Schoolwires, Inc., Whitehall-Robins (now Wyeth) and Chesebrough-Ponds (now Unilever) along with his leadership positions at SmithKline-Beecham (now GlaxoSmithKline) and Primerica. Rick received a Bachelor of Science degree in business administration from Clarion University. 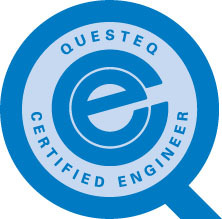 George joined Questeq from GlobalScholar, a K-12 software vendor, where he served as senior project manager. As Director of Technology at 3 Rivers Connect, George provided innovative technology solutions and data consulting services to schools, governments and nonprofits. He also served as Information Technology Director for Peoples Natural Gas and Hope Gas in West Virginia. George holds a MBA from Carnegie-Mellon and a degree in mathematics sciences from Johns Hopkins. Eugene brings extensive experience in business, owning several companies (Novus Staffing and Bella Capelli) and also the working knowledge of a school district to Questeq. He recently served on the school board at West Allegheny School District as its Vice President. Eugene is responsible for growing and expanding our market throughout the United States. Jared joined the Questeq Leadership Team in early 2019 to refocus and expand marketing efforts across all areas of the business. He brings over a decade of leadership experience focused on marketing and business development in industries ranging from telecom to human services, and in organizations ranging from startup to Fortune 50. His work has been recognized in the past through numerous media outlets, including as a former Pittsburgh Magazine 40 Under 40 honoree. Jared is a Veteran and former officer in the United States Army. He holds an MBA from the University of Pittsburgh and a BS in Business Administration from Youngstown State University. Gary joined the Questeq Leadership Team in 2015 as our Technical Recruiter. He comes to us with an extensive background in regional and national recruiting for the healthcare, technology, natural gas and oil industries. As a function of the Human Resources department, Gary is responsible for finding and acquiring the top talent available in the market. He holds a Master of Science in Organizational Leadership from Geneva College, and Bachelor of Science degree from Slippery Rock University. In 2018 Gary was promoted to Talent Acquisition Manager. Tim joined the Questeq Leadership Team in 2015 as our Sr. K12 Account Executive. He comes to us with a combined background of educational and industry experiences. Tim is responsible for identifying opportunities to advance 21st century learning in Pennsylvania Schools through Questeq’s Educational Technology Management Service. He holds a Masters of Educational Technology Management and Masters of Public Management of Information Systems from Carnegie Mellon University, and a Bachelor of Science in Computer Science degree from the University of Pittsburgh. Questeq makes your educational technology management better-not just cheaper. With over 30 years of experience and best practices developed across dozens of schools, the Questeq team can help you transform your school. Visit the Join Our Team page to see available positions. Customer Skills – Engineer possesses the communication and work skills to deal with day to day customer needs and can effectively handle difficult situations. Technical Skills – Engineer possesses the skills and knowledge to maintain, install, upgrade and troubleshoot all assigned IT devices and software. Administrative Skills – Engineer can follow all administrative and work processes and can provide feedback for process improvement. Engineer can learn and follow all customer site processes. At Questeq, people really care about each other. Questeq Team: Submit your bright ideas on how we can improve our services and workplace. Download the form and submit your ideas today!